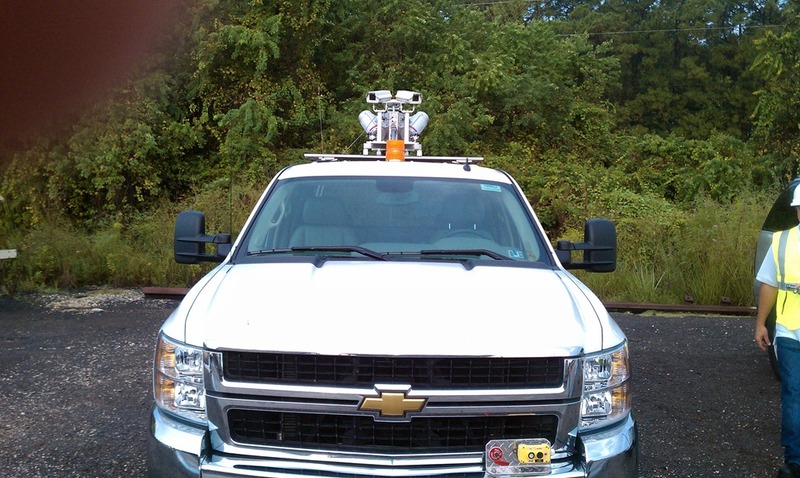 DTS/Earth Eye just completed a positive train control (PTC) project for a national train company who was evaluating the differences between Airborne LiDAR and Mobile LiDAR to support the collection of PTC data. They are currently collecting airborne data for approximately 15,000 linear miles of rail. In certain areas, the airborne data does not provide enough fidelity to accurately map the rails or the asset infrastructure that support the railroad operations. 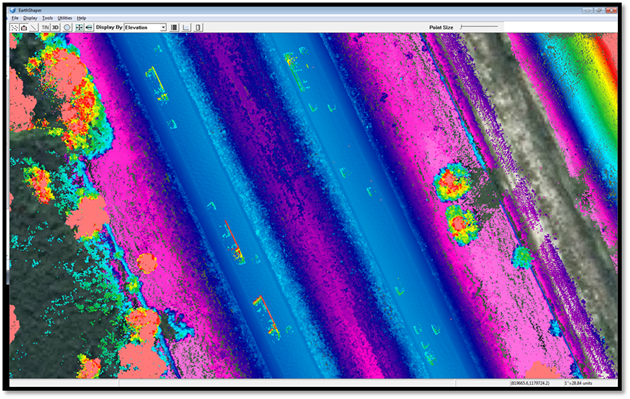 The project involved the collection of Mobile LiDAR using the Riegl VMX-250 as well as forward-facing video to support PTC Asset Extraction. The system was mounted on a Hi-Rail vehicle and track access was coordinated through the master scheduler with the Railroad company. 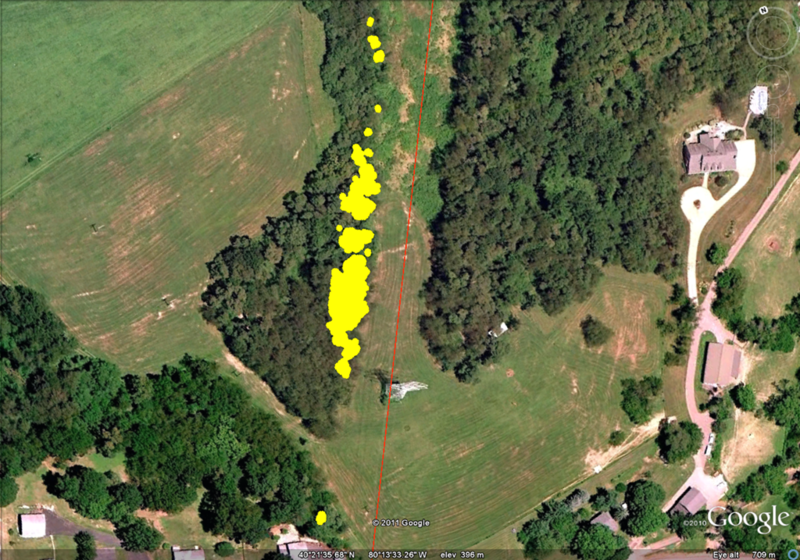 Once we had access to the tracks, we had one shot to make sure the data was collected accurately and we had complete coverage. All data was processed on-site to verify coverage and we had a preliminary solution by the end of the day that was checked against control to verify absolute accuracies. We collected the 10-mile section of rail in about 2 hours and this timing included a couple of track dismounts required to let some freight trains move on through. 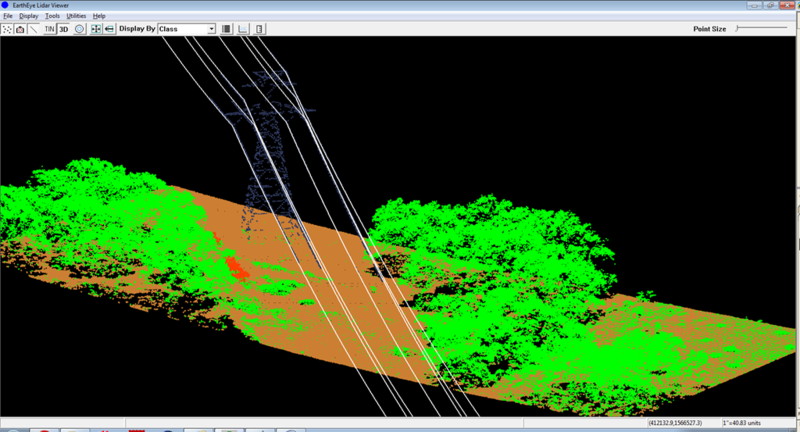 The following graphics illustrate the point cloud coverage colored by elevation (left) and Intensity (right). 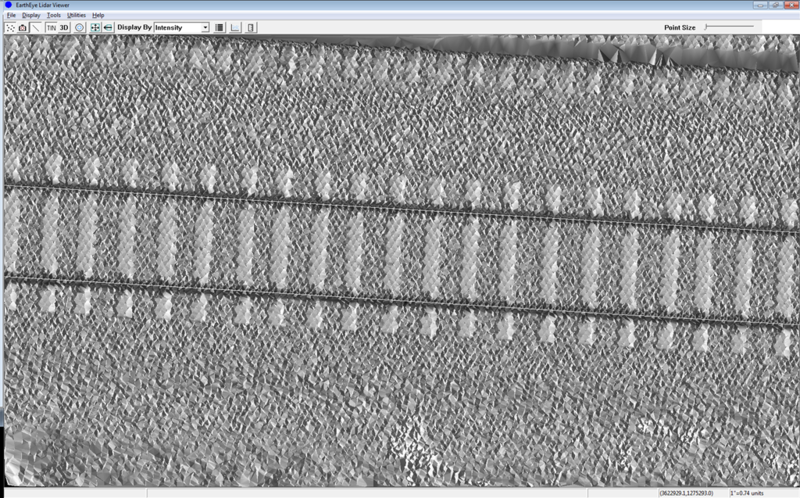 Mapping the rails in 3D was accomplished by developing a software routine designed to track the top of the rail and minimize any “jumping” that can occur in the noise of the LiDAR data. Basically, a linear smoothing algorithm is applied to the rail breakline and once it is digitized the algorithm fits it to the top of the rail. The following graphic illustrates how this is accomplished – the white cross-hairs on the top of the rail correspond to the breakline location in 3D. So, back to the discussion about Airborne PTC vs Mobile PTC data. 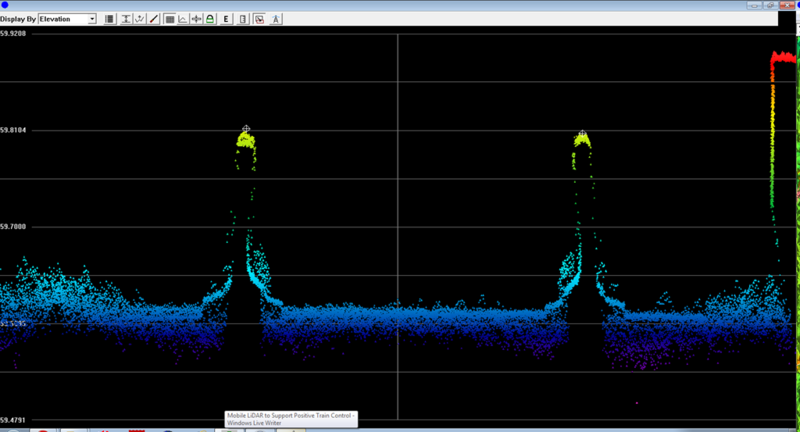 Here is a signal tower collected by Airborne LiDAR. The level of detail needed to map and code the Asset feature is lacking, making it difficult to collect PTC information efficiently without supplemental information. 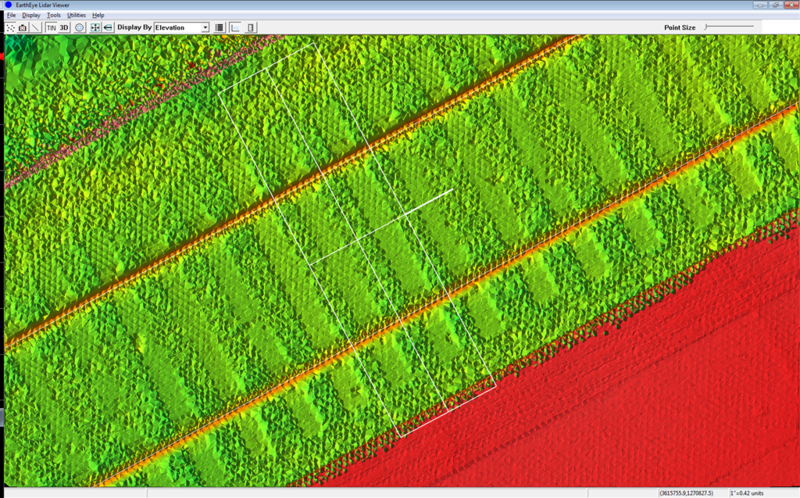 The next graphic shows the detail of the same Asset feature from the mobile LiDAR data. 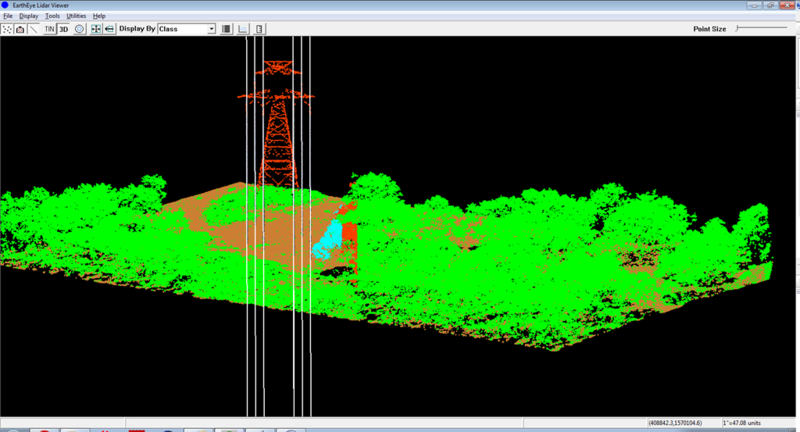 It is much easier to identify the Asset feature and Type from the point cloud. 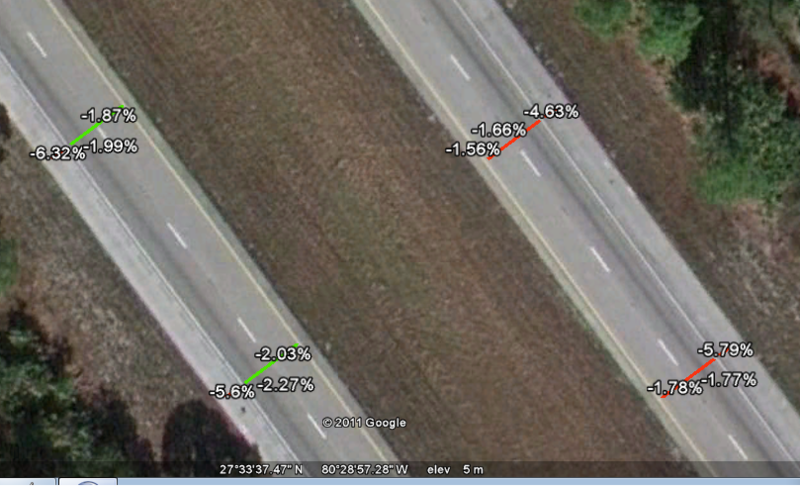 In addition to placing locations for the Asset feature, we also provided some attribute information that was augmented by the Right-of-Way camera imagery. By utilizing this data fusion technique, we can provide the rail company with an accurate and comprehensive PTC database. This graphic shows how the assets are placed in 3D, preserving the geospatial nature of the data in 3D which is helpful when determining the hierarchy of Assets that share the same structure. One last cool shot of a station with all of the furniture, structures, etc that make it up – pretty cool! DOTs across the Country are mandated by the Federal Government to keep track of their roadway assets and to report against these assets to receive Federal funding for their maintenance and repair. 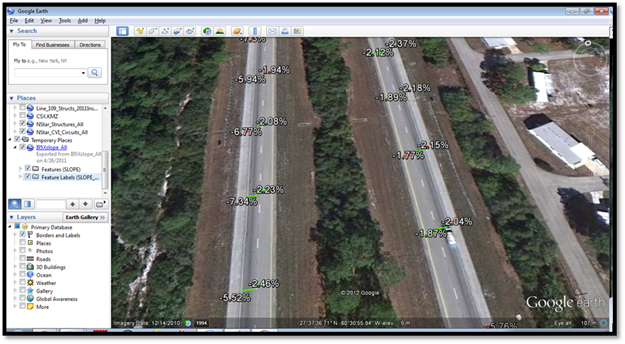 Many DOTs conduct Roadway Characteristics Inventories (RCI) on an annual basis to update and maintain their data relative to these assets. Traditionally, this has been completed using a boots-on-the-ground approach which has been very effective at building these inventories. Many DOTs are experimenting with other technologies, namely mobile LiDAR, to conduct these inventories and to achieve many other benefits from the 3D data captured in the process. The next graphic illustrates the typical technology solution utilized for these projects. 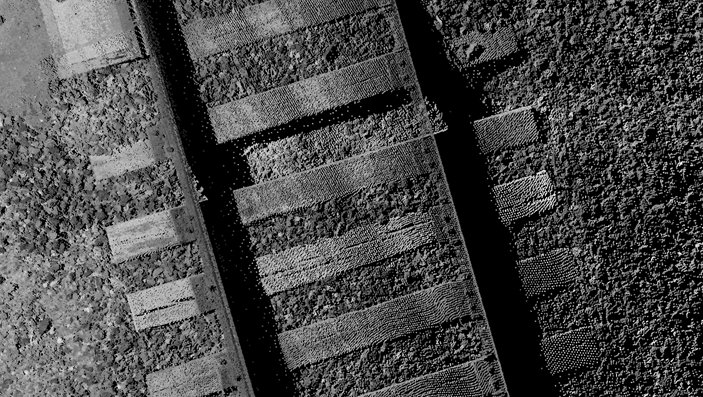 It is composed of the Riegl VMX-450 LiDAR unit, coupled with High-definition Right-of-Way (ROW) imagery. This system can collect at rates up to 1.1 KHz (1,100,000 pts/sec) at a precision of 5mm. It collects points in a circular (360-degree) pattern along the right-of-way from 2 scanner heads facing forward and to the rear of the vehicle in a crossing pattern. The laser captures 3D points at a density of 0.3 foot at speeds up to 70mph. This scanner can be adjusted to scan at a rate that is applicable for the project specifications to limit the amount of data collected and to ensure that the resulting point cloud data is manageable. 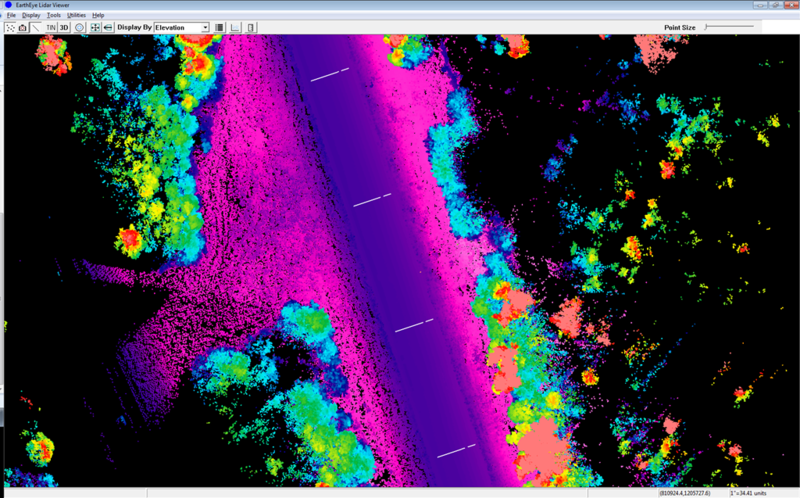 Right-of-Way imagery is also co-collected along with this LiDAR point cloud data. 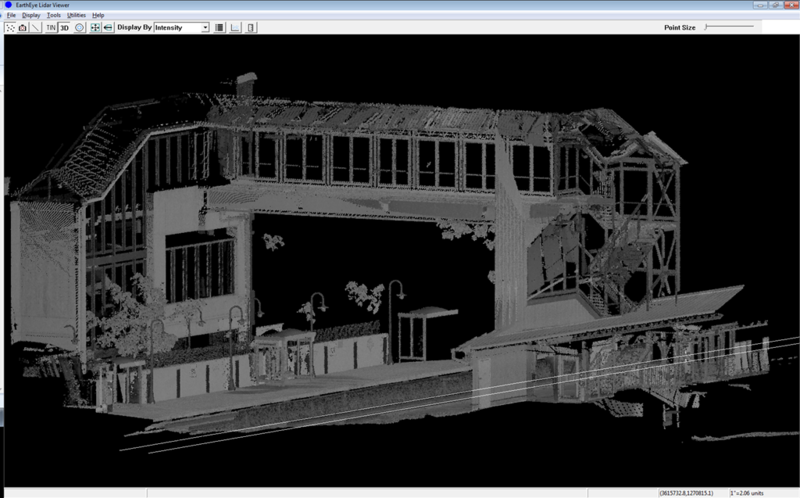 These images are used to identify appropriate attribution for each feature type being extracted from the point cloud. In this example, the DOT has digitized Shoulder, Driveway Culvert Ends, and Drainage Features (Culverts, Ditches and Bottom of Swale). Additional Features such as Signs, Signals, Striping, and Markings will also be extracted and then reported to the Feds on an annual basis. 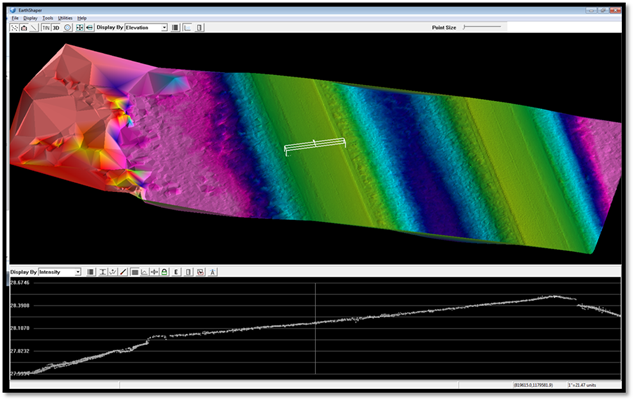 The mobile LiDAR data provides a 3D surface from which to compile the data and then the ROW imagery can be used for contextual purposes to support attribution. This methodology provides an effective process that can be used to create 3D vector layers and accurate attribution used to build a robust Enterprise GIS. Both the ROW imagery and the mobile LiDAR can be used to collect and extract the RCI data efficiently for the DOTs and provides the DOT with a robust data set that can be leveraged into the future. 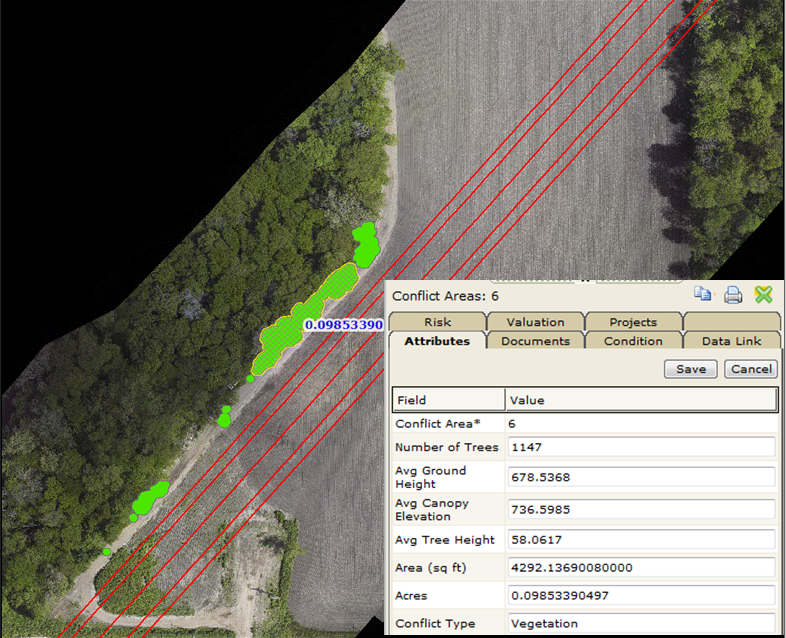 The ROW imagery is typically used to map features at a mapping-grade level while the LiDAR can vary a bit in accuracy. Since the relative accuracy inherent in the LiDAR is very precise, it is used to conduct dimensional measurements related to clearances, sign panel sizes, lane widths, and other measurements that require a higher precision. The DOT utilizes the derivative products from this RCI exercise to report to the Feds in a way that is pretty basic, but effective to achieve their level of funding. For example, the data capture is very technical in nature and focuses on high precision and accuracy. Then, the RCI data is extracted from this source data, maintaining a level of precision that is dictated by the source data. Then, the DOT takes this precise data and aggregates it up to a higher level and reports the total number of Signs or the lineal feet of guardrail. Even though the reporting of this data is pretty basic in nature, the origins of the data can still have precision and accuracy and can be used for other purposes related to Engineering Design or Asset Management. In conclusion, mobile LiDAR and Right-of-Way imagery are a safe and accurate way to collect and report against RCI variables for DOTs. This methodology promotes a safe working environment for both the DOT worker and the traveling public. It is also a cost-effective way to collect large amounts of 3D point cloud data which can be utilized for other purposes within the same Agency. Now that the NERC alert bubble has burst, the transmission and distribution sectors of the power industry has a wealth of information that can be leveraged to enhance their business operations. Most power companies are using LiDAR, Imagery and GPS data to collect detailed information about their infrastructure and this information can be leveraged to develop a GIS-centric Asset Management database. So, what can an agency do to leverage this information, especially when it comes from multiple vendors, sensors and vintages? First, it is important to find the common denominator between all of the data the agency is working with. Utility data typically uses a Structure ID or Span ID that can be used to tie all of this information together from a database perspective. The location of the Structure or Span can also be used to tie information together geographically from a mapping perspective as well as temporally for those agencies collecting information annually or as part of a particular inspection time series. Next, the agency can visualize all of this information spatially utilizing a GIS so that spatial patterns can be observed. Typical spreadsheet-based deliverables are missing the spatial relationships that can be used to develop better maintenance and operation plans by observing how assets interact with one another. This spatial perspective adds another valuable dimension to help agencies prioritize where to spend their limited resources. Finally, a Risk-Based prioritization model can then be developed to help the agency decide where to spend their limited funding resources. The assets that pose the highest risk score based on the Probabilities of Failure and the Consequences of those failures can be prioritized, thus limiting the risk to the agency based on these types of failures. 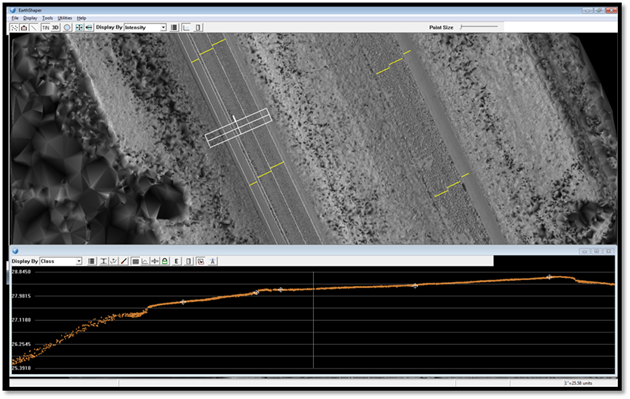 LiDAR data can be captured from fixed-wing aircraft or helicopter platforms, depending on the required resolution of the data. 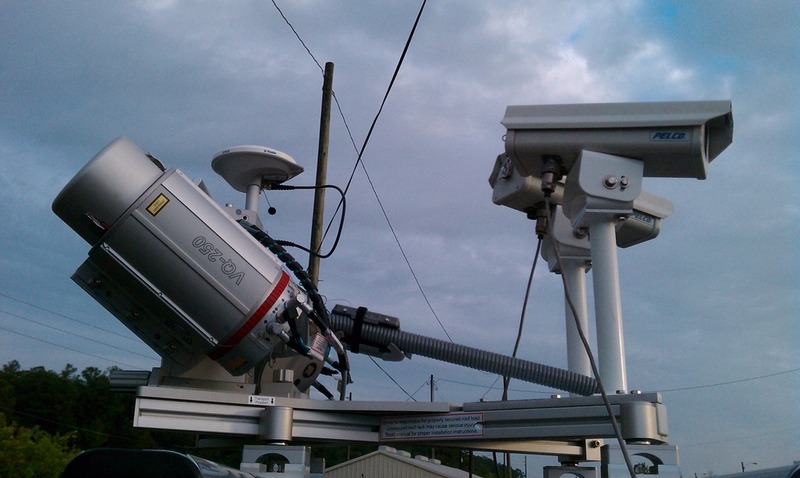 Most agencies are interested in capturing information about features that are located within the right-of-way of a powerline or its associated structures. 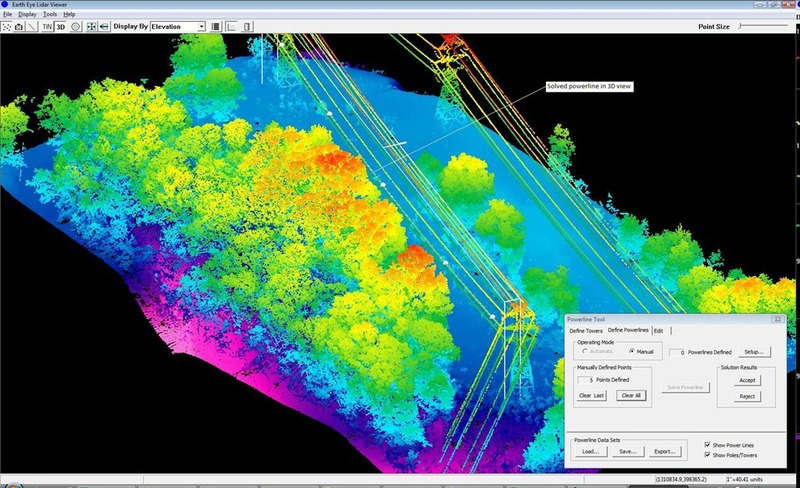 These features are classified in the point cloud and then modeled using encroachment measurement criteria to identify potential hazards to the powerline infrastructure. 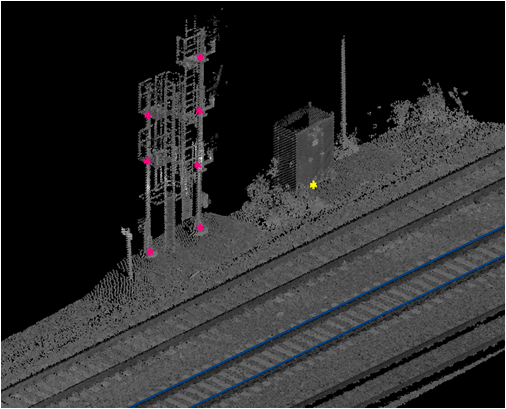 The LiDAR point cloud can be used to model the existing as-built structures, tops of towers, conductors, as well as the bare-earth ground model of the area. This information is then loaded into PLS-CADD software and modeled at a maximum load (sag) and maximum blowout conditions. Any LiDAR features that intersect with these “safe zone envelopes” are flagged as encroachments and will be highlighted in the PLS-CADD reports. These reports are exhaustive in terms of the amount of good information contained within them, but can be overwhelming to an agency when trying to figure out “where” to start focusing their time and resources on corrective actions. Once all of this analysis has been performed, these encroachment features can be geospatially located and mapped for further analysis. 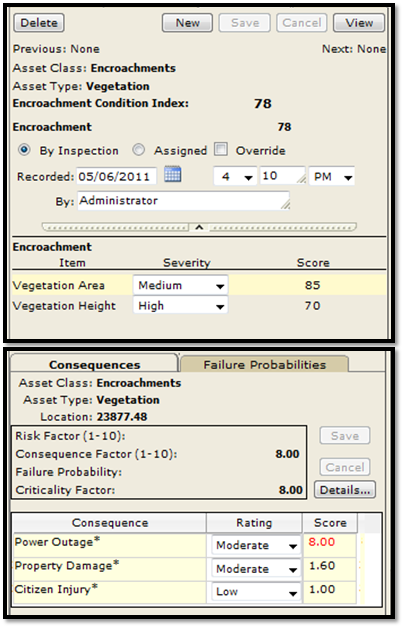 For example, vegetation encroachments can be identified as either “grow-in” or “fall-in” potentials and these points are classified as such. GIS mapping provides the user the spatial context necessary to make informed Operations and Maintenance decisions. As an example, the location of vegetation encroachments is known and with a little manipulation, the volume and area of the vegetation can be determined very easily. This gives an agency the ability to control the costs associated with their vegetation management program. Since the agency knows so much about their encroachments, they can very accurately determine the volume of vegetation that needs to be removed. The agency also knows other geospatial characteristics of the vegetation units and can then apply specific cost factors to the removal process. In addition, GIS also provides a great way to provide contractors with maps and exhibits that will help them generate more accurate bids based on relevant information. A typical vegetation removal contract is assigned to a forestry company who heads to the field and clears vegetation based on their perception of what needs to be removed. Now, agencies can tell the forestry companies exactly how much (estimated) vegetation needs to be removed and WHERE it is. Once your agency has identified where the encroachment issues are, how do you design a plan of action that gives your agency the biggest bang for your buck? In other words, there may be a section of powerline that contains many different encroachment types – Vegetation, Building, Ground Clearance, etc. Another section of line may only have Vegetation encroachments. The agency is most likely handling the corrective actions for these issues out of multiple departments and for good reason. Each type of encroachment brings its own set of design standards or engineering challenges to the table and all of these needs to be considered when designing a corrective action program for the facility. One criterion that can be applied to this information is the concept of Risk. Risk takes into consideration the consequences of failure of a particular asset and then provides a Criticality Index for specific Asset Classes and Asset Types. The more critical the Asset – the higher the priority it gets when determining an agency’s primary work focus. In other words, this concept helps to identify the most critical components of your infrastructure and helps you to prioritize its maintenance over less critical assets. By prioritizing using Risk, an agency can take measures to minimize the Risk that exists in its Asset portfolio by fixing these pieces and parts first. Risk models can be very complicated or very simple. It is dictated based on the information you wish to maintain moving forward and can use multiple automated inputs to help ease the data management strain moving forward. For example, an agency is using their LiDAR information to calculate the risk to a facility based on the number of LiDAR points that have been identified as encroachments as well as their height above ground; the higher the point, to more risky it is to the facility. In other words, the higher the vegetation feature, the more risk it poses to the facility. Since LiDAR data is composed of 3D points, the densities of these points can be applied to the facility’s risk score and then used to help prioritize the facilities that need the most work immediately. Once the facilities have been prioritized using the Risk concepts described above, the agency can then start planning for the actual work activities that will need to happen as part of their annual capital improvement planning activities. This can be achieved by using the Risk scores to determine which facility needs to be worked on and how much it will cost to improve that facility. 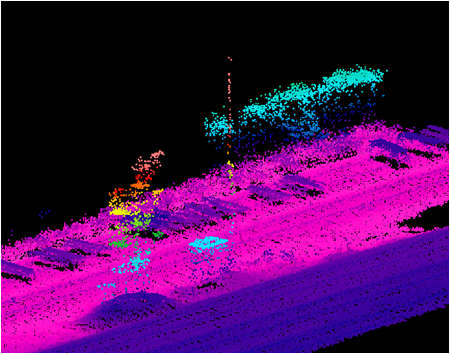 First, the facility components can be modeled from the LiDAR point cloud. As a simple example, we can imagine a distribution facility composed of a wood pole, conductors, cross-arm, guy wires and associated hardware. Each one of these facility components has a cost component associated with it based on the materials used and the characteristics of how it was constructed. The cost of materials can then be applied to each component and an overall facility cost can then be determined for the asset. Once the facility templates are constructed, the agency can then start developing projects to improve or replace these facilities based on the results of the inspection information. This activity will allow the agency to determine the cost of a project in relation to their annual maintenance and operations budgets and then determine what they can improve for that fiscal years’ time frame. All of this information can then be used to determine future years’ capital improvement plans based on funding availability and projected costs over time. This helps the agency to plan for future fiscal expenditures using a repeatable and defensible model that can be applied to different Asset Classes and Asset Types. In other words, multiple, disparate data sources can be fused to support the risk-based prioritization of work activities. Many Departments of Transportation are looking for ways to save money while increasing safety on the roads. In order to do this, they are seeking out innovative ways to do this while utilizing new technology. 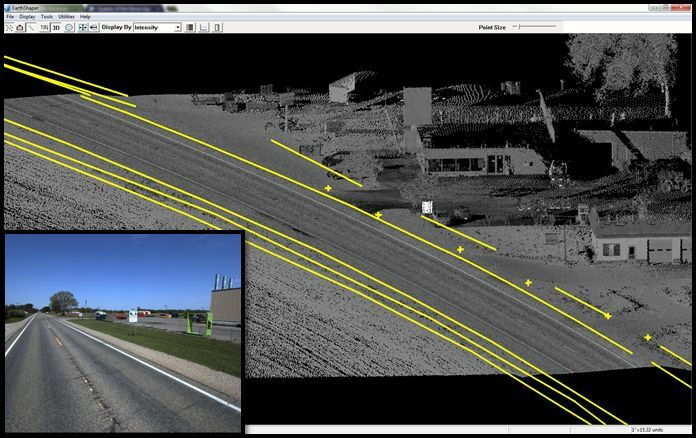 Mobile LiDAR is being used to determine roadway geometry information for long stretches of roadways that are candidates for resurfacing. The typical DOT procurement process involves the selection of a resurfacing vendor through a competitive bid solicitation and then the selection of the most qualified and “cost-effective” bidder. As budgets have become leaner, the competition for these projects has increased and thus, drives the innovation curve to find the most cost-effective solution for the DOT. To achieve this goal, pavement vendors have sometimes turned to the use of LiDAR information to develop their bid packages for the DOT. Historically, vendors would use the as-built information that was available from the DOT which might be inaccurate, old or obsolete. This obviously leads to issues with the information that the pavement vendor uses to develop their bid packages. They are most interested in determining the correct amount of cut/fill needed to resurface the road while using the least amount of new material. One of the most important pieces of this puzzle relates to the cross-slop of the road which facilitates roadway drainage and ultimately makes a road safer for the traveling public. 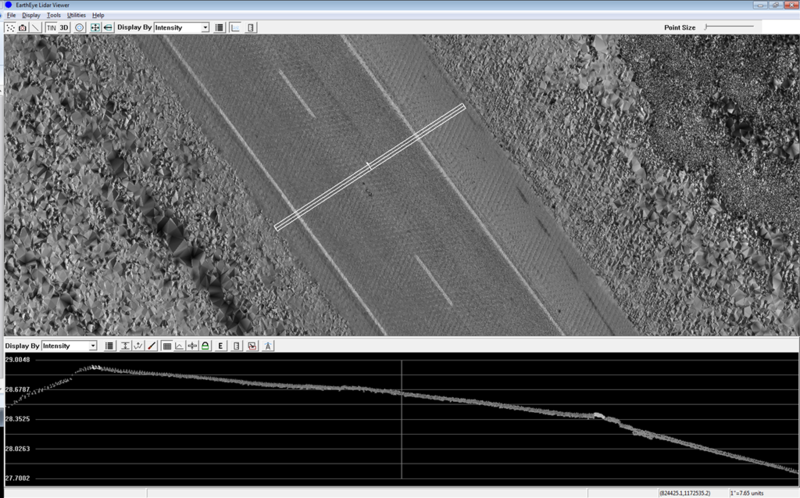 Mobile LiDAR provides a high-precision, digital terrain model of the roadway surface that can be used to generate very accurate cross-slope measurements at specific intervals. For example, the road surface is continuous for the entire length of the project. Cross-Slopes can be generated for each travel lane as well as for the shoulders. The extracted cross-slope is then compared to the design specification and colored based on whether it is in compliance or out of compliance. Once the areas have been identified that are out of compliance, it is easy for the pavement vendor to target those for the re-design effort. Instead of applying an average value across the entire section of road, specific areas can be identified and re-designed so that the pavement vendor can save the DOT money on materials. The ultimate benefit for both the pavement vendor and the DOT lies in the fact that everyone benefits – Pavement vendors can design roads more accurately and limit their risk of material over-runs while the DOT can select the most cost-effective vendor and have more budget available to pave their ever-increasing network mileage of roads. 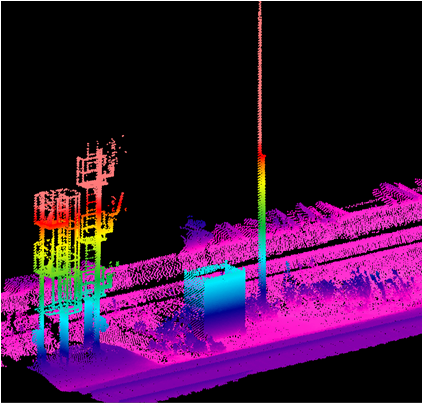 Since mobile LiDAR data is very cumbersome to manage (2Gb/mile) it is important to deliver the data in a format that is usable by the client. Sometimes raw LAS files work and sometimes the client can only deal with vector files that will be used in GIS, Autocad or Microstation, to name a few. We have found that KMZ files are useful as a delivery mechanism because they can be easily loaded and viewed by the client in very short order. Any derivative of these delivery mechanisms will work – it just depends on the expertise of the client and their computing environment. Future discussions will focus on the DOTs and their collection of mobile LiDAR data so that they can provide it to all of the pavement vendors and receive the most cost-effective bid packages. Although there is an up-front cost associated with the LiDAR collection, it is believed that the downstream cost savings for both the DOT and the pavement vendor will more than outweigh the up-front cost of collecting the mobile LiDAR data. What are you going to do with your NERC data? So, you’ve collected your entire Transmission network using LiDAR, built your PLS-CADD models and identified your encroachments – what’s next? How about leveraging that data to manage the Work Activities required to upgrade/maintain your Transmission network? We have all heard about Asset Management and how it can help an agency extend the useful life of its infrastructure. We all know that in principal it makes all the sense in the world, but the actual application of these concepts require investment in software, hardware and personnel. What we will never know is – How much should we invest in the management of our assets? Using the NERC regulation and the frenzied data collection going on in our industry as an example, consider the following. 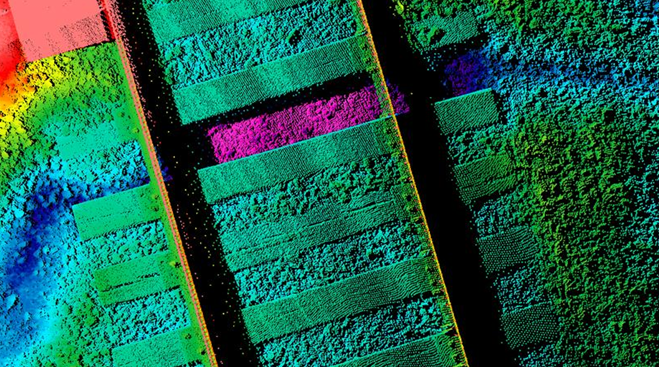 Most Airborne LiDAR companies are collecting and delivering data in the $500 – $1,500 per linear mile range, depending on the downstream processing requirements. Most of this data is delivered to the end user as .LAS point clouds, PLS-CADD .BAK, files and some other CAD or GIS formats. Once it is delivered, the agency has a unique opportunity to leverage the delivered products for future value. If we use Vegetation Encroachment data as an example, we can illustrate how the encroachment information can be used to create a vegetation Asset Class and managed throughout its life-cycle. Most likely, the data delivered to an agency will include .LAS point clouds with classified data reflecting terrain, conductors, towers, buildings, etc. 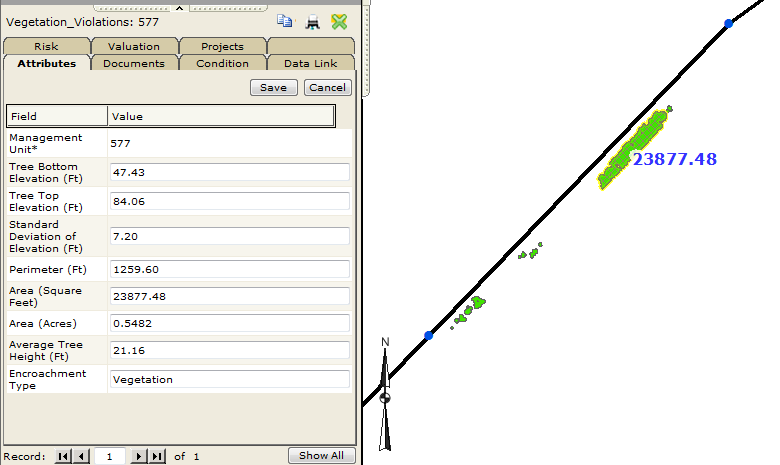 In addition to this, vector data is also delivered and can be used to support maintenance management activities. The graphic below illustrates a common Transmission LiDAR deliverable. Note the Red vegetation in the graphic above. It shows the vegetation points that have been flagged as encroachment violations based on its proximity to the conductors. These points can then be mapped in a GIS or Asset Management program for further analysis. In doing so, an agency can gather more value from this information. For example, the graphic below illustrates the “grow-in” (light blue) and “fall-in” (red) violations for a section of Transmission line. GIS mapping provides the user the spatial context necessary to make informed vegetation management decisions. First, the location of vegetation encroachments are known and with a little manipulation, the volume and area of the vegetation can be determined very easily. This gives an agency the ability to control the costs associated with their vegetation management program. 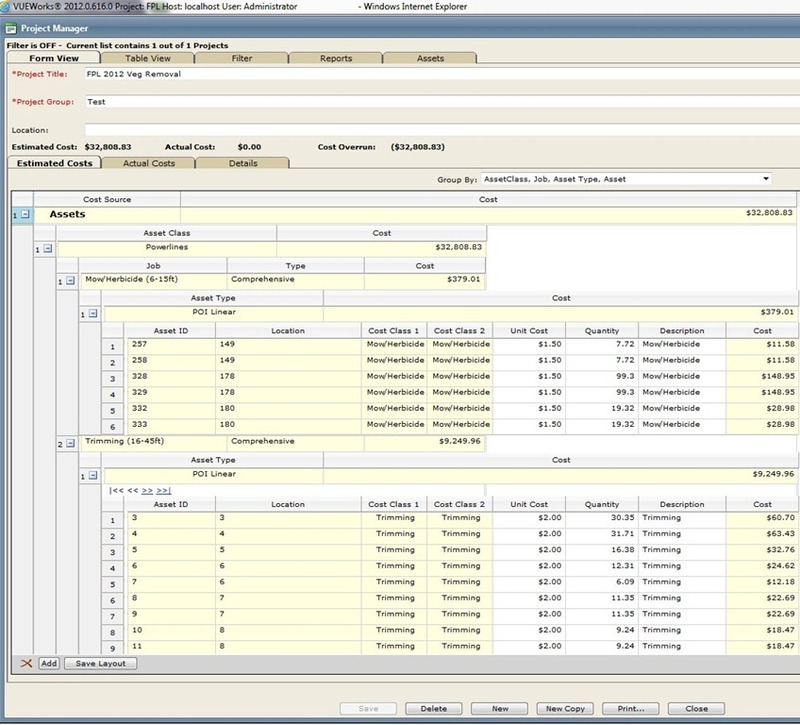 Asset management software that leverages GIS can provide the tools necessary to develop an immediate return-on-investment of the software purchase and associated data collection expenditures. Since the agency knows so much about their encroachments, they can very accurately determine the volume of vegetation that needs to be removed. The agency also knows other geospatial characteristics of the vegetation units and can then apply specific cost factors to the removal process. In addition, GIS also provides a great way to provide contractors with maps and exhibits that will help them generate more accurate bids based on relevant information. The graphic below shows a KMZ export of Vegetation Encroachments that can be provided to field units in charge of vegetation removal. A typical vegetation removal contract is assigned to a forestry company who heads to the field and clears vegetation based on their perception of what needs to be removed. Now, agencies can tell the forestry companies exactly how much (estimated) vegetation needs to be removed and WHERE it is. Pretty amazing concept to embrace because now an agency can accurately predict the costs of their vegetation management program. Another factor that can be applied to this information is the concept of Risk. Risk takes into consideration the consequences of failure of a particular asset and then provides a Criticality Index for specific Asset Classes and Asset Types. The more critical the Asset – the higher the priority it gets when determining an agency’s primary work focus. In other words, this concept helps to identify the most critical components of your infrastructure and helps you to prioritize its maintenance over less critical assets. By prioritizing using Risk, an agency can take measures to minimize the Risk that exists in its Asset portfolio by fixing these pieces and parts first. None of this stops once you get to the Work Management piece of the puzzle. I’ll be providing more information related to tracking the work activities as they are completed in the field and using this information to develop more accurate budget forecasts for the future. 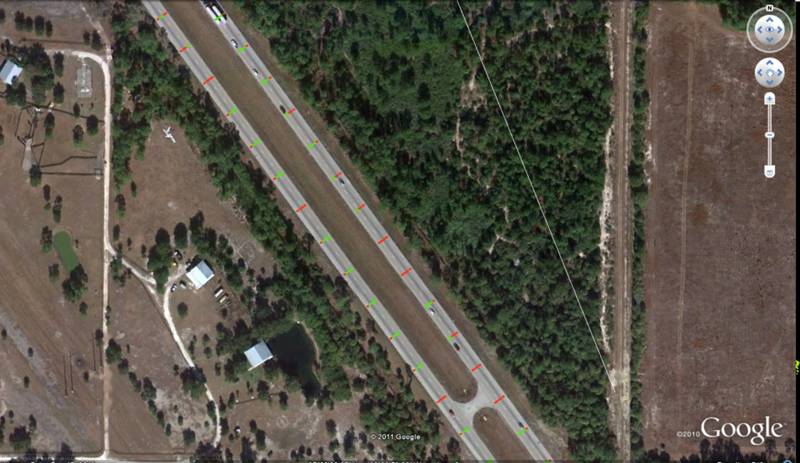 DTS/EarthEye just completed a 9-mile mobile LiDAR scan of I-95 here in Florida and provided one of our partners with cross-slope information in a period of days. 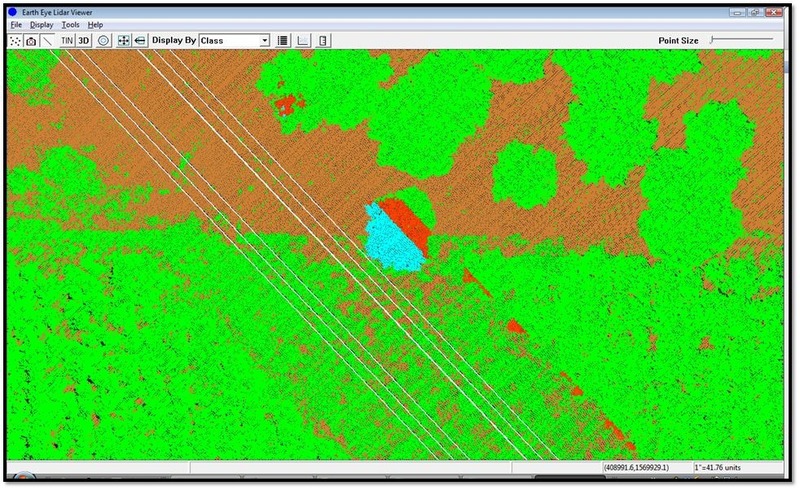 The data was collected with our buddies at Riegl USA using their VMX-250 mobile LiDAR. This information will be used to generate pavement resurfacing plans for the Florida Department of Transportation (FDOT). This project shows the value that this type of project can provide to the end user on both sides of the fence. First, the paving contractor can use this data to develop their 30% plans for submittal to FDOT when bidding on a resurfacing or re-design contract. Having accurate and relevant data related to the roadway’s characteristics gives the paving contractor an edge over the competition because they know what the field conditions are before preparing an over-engineered design specification. This happens all of the time because the detailed field conditions are unknown while they are preparing their plans and they only have historical information to work from. On the other side of the fence resides the FDOT. They can benefit from this information because if they can provide this detailed information as part of a bid package, they can reap the benefits that are gained from better information. 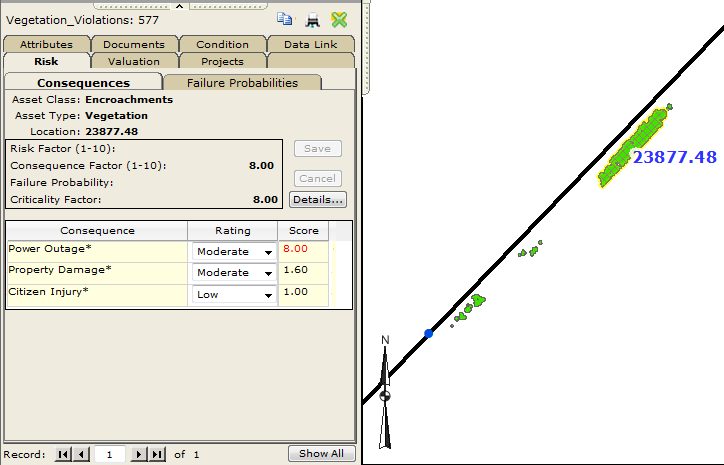 If all contractors have the detailed as-built information (or in this case, accurate cross-slopes), they can all prepare their submittals using the same base information. 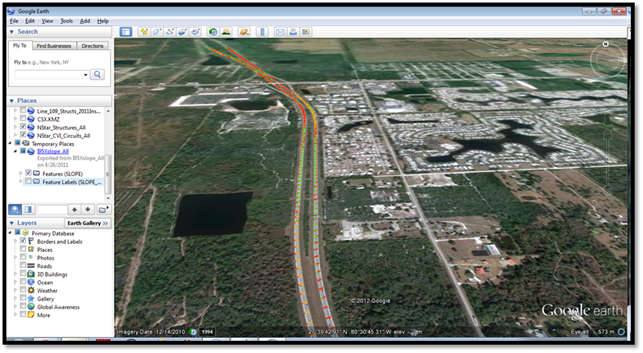 This will provide the FDOT project manager with more accurate responses based on true field conditions, resulting in more aggressive pricing and decreased project costs. Here are some screenshots of the information. Once the data has been collected and calibrated, we generate cross-slopes at a defined interval and export those out as 3D vectors. These vectors are then symbolized based on their cross-slope percentages and exported as a KML file for ease of use. Although this is a pretty simple step, the presentation of the data in Google Earth makes it easy for the end-user to visually identify problem areas and design the corrective actions according to field measurements.